We Specialize in Sewer & Drain Line Repair & Replacement and service both Commercial and Residential Customers in Central Texas. Sewer & drain line repair and replacement to correct a number of problems, including: broken, cracked, offset or collapsed pipe, damaged pipes due to shifting soil, and corrosion. Sewer & drain lines are responsible for removing wastewater from a structure to the city sewer system (or septic). Generally, these lines rely mostly on gravity to operate, with lines that slope down and away from each fixture (sink, toilet, etc.) into the main sewer line. Drain Lines - Wastewater lines that are located beneath a structure. Sewer Lines - Wastewater lines that are NOT located beneath a structure. Sewer & drain lines are generally made from plastic, cast iron or clay. Repairing and replacing sewer & drain lines under a foundation is a major effort. Often, but not always, there will be symptoms of drain or sewer problems before the situation becomes critical, with leaks or backups. The first step in sewer & drain line repair is to find the source of the problem by performing a video camera inspection of the sewer & drain lines. CastleRocks’ inspection cameras have the most recent technology; the cameras demonstrate both distance and depth of the camera location (and line). The video camera is snaked through the lines to visually inspect and evaluate the integrity of the lines and locate the cause of damage / blockage. CastleRock uses this information to formulate the least costly repair to resolve sewer & drain damage. Once a best course of action has been determined, a detailed repair plan will be presented to the homeowner in the form of an Inspection Report (PDF file). Whether it’s a simple repair or major replacement, we’ll explain all options and provide you with up front pricing so you know the costs involved before work begins. Hydrostatic test – Consists of filling the sewer & drain line with water. CastleRock often performs hydrostatic tests to determine if sewer & drain lines have been compromised. The hydrostatic testing process starts with the removal of a toilet on the first floor. Using a clean-out as access, the sewer line is intentionally blocked with an inflatable ball. The lines are then filled with water. The water level is monitored during a 20-minute period. A drop in water level indicates one or more leaks in the system. A steady water level indicates that there is no leak present. An additional step must be taken if the water level test indicates a leak is present. The isolation test is used to pinpoint the location of all leaks in the plumbing. This test is similar to the initial test, but separate areas will be tested individually to find the location of leaks. All of the toilets located on the first floor of the building must be removed in order for this test to be completed. One or more inflatable balls are placed in the system to find leaks. The water level is tested on each line to determine which area is experiencing problems. A map is then drafted based on the results of this test. A detailed plan illustrating all lines will be presented to the homeowner in the form of an Inspection Report (PDF file). In Central Texas, due to our expansive soil, damage to sewer & drain lines are common. Expansive soil often causes broken, cracked and collapsed pipes as well as settling and “bellies” in the lines. Prior to 1970, homebuilders installed cast-iron lines that have reached the end of their useful life (45yrs). Over time, these lines corrode at the bottom of the pipe creating an open channel between the interior of the pipe and the soil beneath it. Due to the high clay content in Central Texas soil, foundations heave and contract with weather cycles. This movement causes stress on sewer & drain lines often causing failure. Other pipe damage includes tree root intrusion. Tree roots, constantly seeking moisture, find their way into sewer / drain lines, over time, they cause major blockage and can even rupture lines. A damaged sewer / drain line is a serious problem, if not addressed, water and the resulting heaving soil will likely cause additional sewer line and foundation damage. Sewage leaks can also pose a health threat. When choosing a plumbing company to perform sewer & drain replacement, a property owners main focus should be the excavation portion of the job. Trenches and tunnels must be excavated to expose the sewer & drain lines for repair. Tunneling beneath a commercial or residential building requires specific procedures and safety standards. It is a complicated process that only a true professional can perform. When we tunnel beneath your foundation, we make sure you are educated and informed every step of the way. We hire top professionals and invest in the best training methods and equipment ensuring that tunneling is achieved safely, promptly and effectively. Our employees hold multiple OSHA certifications and attend safety training workshops regularly. Are the excavators employees or sub-contractors? Do the excavators follow required OSHA procedures? Do the excavators have OSHA certifications? Will I receive an engineer’s letter from the excavators? Do the excavators have a contractors’ license or contractor registration card? Tunneling is the process of digging a tunnel under a home foundation. Tunnels must be dug by hand and is very labor intensive. Tunneling requires proper planning (to meet OSHA requirements) and lots of manpower to safely and affordably complete the job. Tunneling, drain line replacement and foundation repair are what we do best, they are our specialties. It is important that tunnels are excavated with your foundation in mind as to not compromise the foundations’ integrity. As both a sewer & drain company as well as a foundation company, we take the necessary precautions to protect the integrity of your foundation. Once the tunnel and plumbing repairs have been completed, an independent certified engineer will review the project. The engineer will ensure that the foundation has not been compromised and that all work was performed by industry standards. The engineer will produce a report to be shared with both the city inspectors and homeowner. After passing the engineer and city inspections, we will backfill the excavation and patch all concrete access holes. If contacted, the engineer will discuss the project with property owners and anyone related to the project. 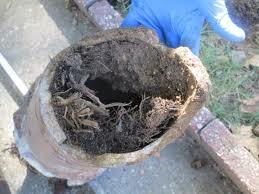 Traditional repair (excavate & replace) is most often the better solution to sewer & drain line repair. Trenchless pipelining repair involves making access holes where damaged pipe begins & ends and then pulling the liner through the existing pipe. Pipelining is an epoxy liner that hardens as it cures. In many cases, pipe lining appears to be a great alternative to trenching, but may not be the miracle solutions it appears to be. Due to the unreliability of trenchless pipelining, CastleRock does not offer this service. Trenchless pipelining can not resolve the majority of sewer & drain line problems, i.e. broken lines, offset joints, obstructions, root intrusion, backfall, bellies, insufficient pitch, etc. In addition, the long-term success of the pipelining is dependent upon the integrity of the failing pipe that the liner has been installed in. Significant expertise and the experience of a seasoned pro can help avoid most trenchless problems, however, an inexperienced contractor can cause more harm than good. Note, even the experienced pro doesn’t always know if success is obtainable until the lining process has begun or has been completed. Before beginning a trenchless project, be sure to do homework about the potential risks and research the alternatives. Trenchless sewer replacement is not a job for your average plumber. Look for an experienced contractor in your area who can help navigate issues as they come up and knows how to meet permit requirements and codes so inspections go smoothly. Note, pipe lining may be your only solution if you cannot perform tunneling / trenching. All of CastleRocks’ Sewer & Drain Line replacement projects are supervised by a Responsible Master Plumber (“Responsible” – industry certification). At CastleRock we strive to work in a safe, clean and efficient manner at all times. The construction of underground tunnels are an essential but dangerous activity. Working under reduced light conditions, difficult or limited access / egress, with the potential for exposure to air contaminants, underground workers face many dangers. To help employers protect the safety and health of underground construction workers, the Occupational Safety and Health Administration (OSHA) has prepared a number of guidance documents, including the underground construction regulations, found in Part 1926, section 800 of Title 29 of the Code of Federal Regulations (29 CFR 1926.800). At CastleRock, we take these guidelines seriously and follow them closely. Our employees work in teams of two or more and are trained to recognize and respond to hazards associated with tunneling & trenching. The plan of action is tailored to each specific jobsite and includes any unique issues or requirements. CastleRock maintains open lines of communication with its workers at the worksite to ensure a rapid and complete exchange of information concerning events or situations that may impact worker safety. We stress to workers in and around the jobsite that they should not perform an activity they are not comfortable performing. Our team training is tailored to the types of jobs in which we work. Specifically, air monitoring, ventilation, illumination, personal protective equipment, emergency procedures and mechanical equipment. If natural ventilation does not provide the necessary air quality, we direct fresh air into our tunnels. Every jobsite has a "competent person" as defined by 29 CFR 1926.32 (f) who is capable of identifying existing & predictable hazards. The competent person is responsible for crew safety, air monitoring, ground stability and the transport of equipment. The competent person must inspect the roof (slab), face, and walls of the work areas periodically during the day to ensure ground stability. Trenches more than 5 feet in depth must be supported by a trench shield. We place barricades and warning signs around trenches and tunnels to prevent entry into the work space by individuals other than permitted workers. CastleRock Excavation prices include OSHA approved devices for our workers. Our clients are not required to provide our workers with safety equipment. In addition to plumbing codes, most municipalities have specific guidelines for plumbers and require permits for residential and commercial projects. CastleRock will work with your specific municipality and local inspectors to ensure the project is completed to the municipalities specifications and that the permit has passed all stages and has been closed. CastleRock’s plumbing license number: M-42049.